The Tutor's Daughter is a historical romance set in the early 1800's, which follows the story of Emma Smallwood as she moves with her father to a manor on the Cornwall coast to tutor a baronet's two sons. 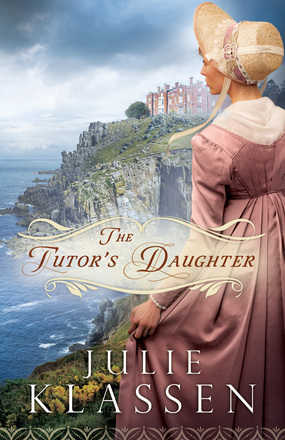 With a heavy Jane Austin influence, complete with familiarly named characters and plenty of chapter opening Austin quotes, The Tutor's Daughter has all the elements of a page-turner: secrets, mystery, suspense, suspicion, and romance. If you like historical romance and are a Jane Austin fan, this book will not disappoint. Emma Smallwood is a teacher at her father's private school, Smallwood Academy. After her mother's death, she and her father are invited to the Weston's to tutor the two younger sons. Emma reconnects with Henry, a student from the past and was smitten with him. There are many family secrets, and much mystery and intrigue throughout the book. Who is playing tricks on Emma? At first, the book seemed to move at a slow pace for me, but by the time I reached the middle of the book, the pace picked up. I stayed up late to finish it. Overall, it was a book I enjoyed very much. I loved the way the characters were developed in this book and the way prayer and trusting God became an important part of it. Follow this link to The Tutor's Daughter for an excerpt, discussion questions, and author interview, and watch the book trailer.